Andrea Kosavic is a PhD candidate in Communication and Culture at York University. She holds a Master of Information Studies (MISt) in Information Systems from the University of Toronto, and a BSc in Biology from the University of Toronto. 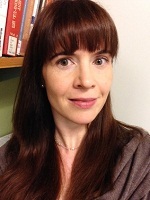 Her work in the field of scholarly publishing in her capacity as Digital Initiatives Librarian at York University prompted her interest in pursuing an in-depth exploration of disciplinary cultures. Her PhD work will focus on scholars in the humanities and the means by which they work towards establishing a scholarly reputation. She is particularly interested in the factors that affect a faculty member’s choice of publication vehicle, and the role publication prestige has in dialogue with variables including peer review, tenure and promotion requirements, status of university, and the idiosyncrasies of discrete disciplines and university departments.